I tend to hang on to things that I see as having some value to someone. I like to “fix” things and make them work or be useful again. I’m not to the extreme of being a “hoarder” but I still keep too much stuff with usually good intentions. What generally happens is after a long while the stuff winds up being donated somewhere, which is exactly what I should have done from the start. This past weekend it was clear, I needed the space in my house that my mom had occupied the last couple of years of her life back, without her or her stuff in it. After she died, I had gotten rid of a lot of things, furniture had been reused elsewhere or stored, but there was still some baggage there, both literally and a little bit emotionally. So this past weekend I started cleaning. 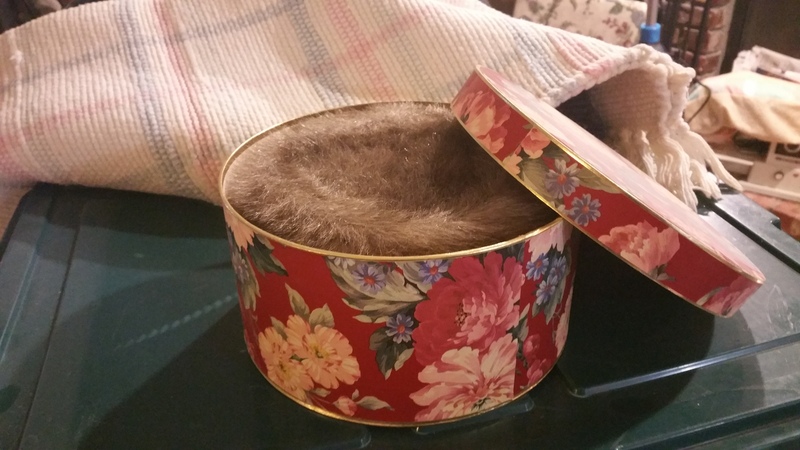 Two do nation loads later of trinkets, her “pretties”, full perfume bottles still in their original boxes, clothing she’d never worn, bed sheets she’d saved for years, blankets, even a fur hat in a beautiful hat box, I found a box I’d forgotten I’d kept. It was all of her makeup. The stuff that she’d touched almost daily for most of her life. She loved her makeup. She loved to put it on and stare at the transformation in the mirror. She bought cream after cream reliving conversations and events of her lost youth and her young, single life. She was always searching for the perfect match to her skin tone, the prettiest blush, or the best lip color, but never really found it. She’d shop for hours at the makeup counters of Macys, or at the drug store. She’d put little smudges of foundation or lipstick on the backs of her hands and look at the colors under the lights all afternoon. She lived for the potential of what the makeup could do for her and the happiness it could potentially bring her. And after she bought it, it took her an hour every day to apply her makeup. She’d sit at her vanity and carefully apply each item, examine how she did, think about what it all meant, and then move to the next thing. She’d smoke a cigarette in between, sip her coffee and have imaginary arguments with the past and people that weren’t there that this makeup would have won over. She didn’t display pictures of me, of family or even her grandson, but she had her makeup, her things and her hopes and dreams. After dementia had really started to take its toll on her, we moved her to our house. I made a special effort to make sure her pretties came with her, so she would feel connected to something familiar in her new space. We moved her vanity as it was with all her makeup and her things arranged in it, and put them right where she could see them and she could possibly enjoy them. I don’t think she ever did though. She was too far along by then. She rarely bathed in her last few years in her apartment, refused to wash her hair, and couldn’t remember to brush her teeth or when to take her medications. After we moved her, she was bathed by aides, took her medications when we gave them to her, ate when food appeared, and she slept when she was tired. She stopped trying to be pretty on the outside anymore. I don’t think the face in the mirror matched the face she saw in her mind anymore, it was a stranger in the mirror. She mostly sat on her sofa, in a quiet, dark room, by herself, smoking and having her conversations with ghosts. When she died, I’d just dumped her vanity drawers into a box to get it out of the way. I don’t know why I didn’t throw it away then, but it seemed important to her memory to keep it. It’s who she was. This stuff meant something to her. There is was, in the back of a closet, where it had been for the last five and a half years. I’d already sorted through and donated a lot of her trinkets, her Avon perfume collection, boxes of table cloths, sheets and some of her purse collection that day, and there it was, her makeup. All the things left that she intensely cared about as a younger woman, that defined who she was, that she used ritually for years and years before dementia took over. 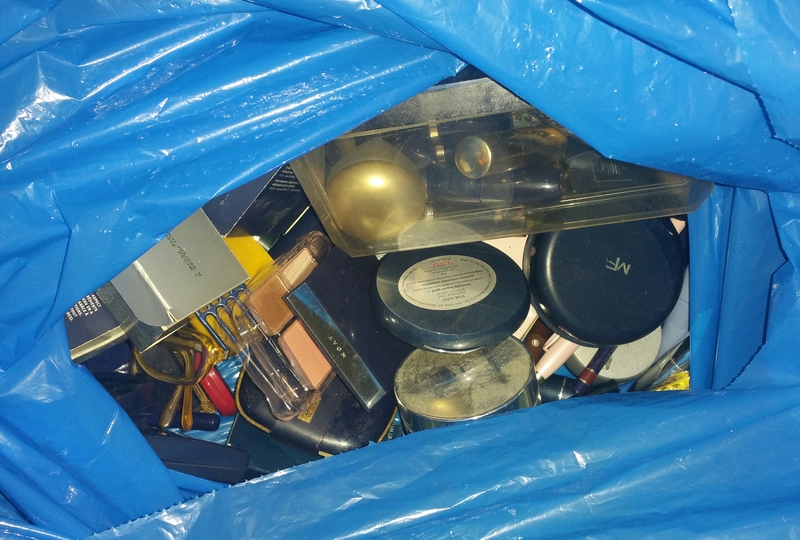 As I threw all the makeup in a trash bag and stood back and thought about it, I felt sadness and loss. There were hundreds of dollars of things here, money all spent years and years ago, but that wasn’t it. It was the stuff my mother had placed her hopes and dreams of happiness on. I had a realization that she was a really unhappy person who didn’t know how to be anything but unsatisfied with herself or her life. I also realized how much she was used that unhappiness with others to get the validation and necessities she needed to survive. Her legacy was a box of makeup that couldn’t in death make her any happier or content than she thought it might do for her in life. The feelings I felt looking at that trash bag were completely unexpected. I don’t regret getting rid of everything, it needed to be done. Mom’s ashes still occupy a box in the closet. I saved her partial plate, a little black stuffed dog she’d grown attached to in her last years, and a pillow. One day soon, I’m going to gather the family that wants to go, and we’re going to do something with this little bit that’s left. What memories of my mother we have will live on in me, and my son, her brother, nieces and nephews and they are what they are. Sadly, with or without makeup she was unhappy in life, and it’s all she knew how to be, and that’s the memory most of us will have. Godspeed, mom. I hope you’ve found the happiness there that you could never find here.